The Kalorik buffet double burner has two durable cast iron solid heating elements which deliver heat evenly to pot or pan, two high-precision thermostats offer sensitive heat control to keep food simmering or boiling. 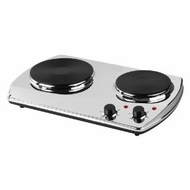 This double burner is ideal for dorms, offices, entertaining as well as for traveling, its great silk design makes it easy to store and with its elegant chrome finish it fits perfectly on your countertop. 20-inch by 13-inch by 4-inch. UL Listed. Imported.